Performance of The Fifty Year Sword. Photo by Ricardo Miranda. On Halloween this year, instead of being the best sugar pusher in the neighborhood, or following your inappropriately costumed progeny as they amass their candy fortunes, or abandoning your own hard-earned dignity for a night of brew-fueled revelry, let me steer the adults amongst you to REDCAT, the CalArts downtown theater at Walt Disney Concert Hall, where for one night only, Mark Z. Danielewski will conduct a staged reading with shadow puppets and musical accompaniment of his Halloween-set story, The Fifty Year Sword. The evening will also raise funds for the Juvenile Diabetes Research Foundation (JDRF) in honor of the son of one of Danielewski's close friends, who was diagnosed with Type 1 diabetes on Halloween. "The Fifty Year Sword is a tale that is told to five orphans," Danielewski, 45, explained recently, "and slowly, through the tale, you realize that the orphans are being threatened and that threat is severe enough to curtail their lives. Anyone who is cut by any of the swords will feel that cut in their 50th year... It creates a very specific date, and, on a philosophical level, if you knew you were going to die at this time, it would shape your life. So the idea is, how do you protect those children, and who protects them?" 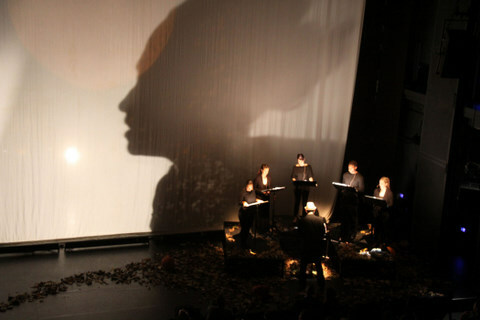 The performance will feature five actors providing the voices, the 40-foot shadows of shadow-caster Christine Marie, sound design by John Zalewski and music from several original Harry Partch instruments (which is appropriate, as Partch created his own instruments to play a tonal scale of his own invention, much as Danielewski does through his fiction). Danielewski, author of the experimental novels House of Leaves and Only Revolutions, has lived in Los Angeles for more than two decades, and this performance at REDCAT is a continuation of his attempts to give meaning to contemporary life by pushing the conventions and traditions of storytelling. Danielewski was born in New York City. His father, Tad Danielewski, was a Polish-born director and acting teacher who, as a young man, survived the Warsaw uprising only to be sent to a Nazi labor camp before being rescued by the American forces. In the United States, Tad was a director during the golden age of television, directing Omnibus, then went on to become a programming executive at NBC who, among his claims to fame, gave Woody Allen his first TV job. However, when the younger Danielewski was growing up, his father was working on a series of films that had the family moving to far-flung locations, including traveling to Ghana for the Emmy Award-winning series Africa and working with Nobel Prize winner Pearl S. Buck on The Guide, about India. Danielewski said his parents presented culture as something both accessible and not expensive. "You go to the Prado and look at these amazing paintings, and my Mom would say, 'Draw this.' We would go to the movies, and my father would say, 'Let's talk about how this is a political movie. How is it made?' "
Danielewski says he made many good friends, some of whom he remains close with to this day, but they were not, in his words, "like-minded ... They did not have a sense of cultural value." The result? "I have this advice for parents who want their kids to go to great colleges," he said. "Move them to a place that they deem as hellish. It will motivate them to get out of there. I knew that going to a good university would allow me to get back to a place where people like analyzing movies and reading texts." Danielewski found all that, and Harold Bloom, at Yale. Although he never took a course from Bloom, he knew he was among those infected with Bloom's love of literature. Danielewski, who graduated in 1988, majored in English at a time when Yale was swirling in the controversies surrounding deconstructionist literary theory, but Bloom inspired in Danielewski a love of Shakespeare and Wallace Stevens. Danielewski also was drawn to the romanticism of the French poets  Apollinaire and Mallarmé as well as Rimbaud and Verlaine, whom he first learned of through a song on Bob Dylan's Blood on the Tracks. If I dwell on Danielewski's formative intellectual roots, it is because they continue to inform his work. Danielewski said he knew from childhood that he would be a novelist. House of Leaves, which Danielewski began when he was 26 and published 11 years later, combines every form of literature that interests Danielewski, from the traditional coming-of-age story of a young hipster, to the Hollywood genre films, to academic citations, including footnotes replete with irony; it is a meta-work of the modern age. As Danielewski said by way of analogy: "In the old days, you were going to have one job that was going to last most of your life. Nowadays, kids have three or four jobs and... they're assembling a life." Similarly, Danielewski, who at various times has been a plumber, English teacher and served morning coffee, has assembled not only a life, but a lifework. He said he sees the Halloween performance of The Fifty Year Sword as part of an ongoing effort "to get out of my comfort zone." Dealing with a range of personalities, booking rehearsal studios and reacting to how performers change his words is not his usual form. Which is why, if you are looking for a different sort of Halloween evening, REDCAT is for you. "The piece is not entirely accessible," he admits. "It's difficult. You have to think about it. There is a very definite meaning there, and it does emerge." "These are complicated ideas: What is, exactly, forgiveness, what is fate, what holds things together, what cuts things apart?" So consider it this way: "We're raising money for the JDRF. It's for those people who don't want to have sugar. It's... substantial. So maybe I'm offering apples instead of candy," Danielewski, said, adding with a laugh, "and maybe those apples have razor blades in them." "Mark Z. Danielewski: The Fifty Year Sword," Mon., Oct. 31, 8:30 p.m. Roy and Edna Disney/CalArts Theater, 631 W. Second St., downtown. (213) 237-2800. redcat.org. The above article appeared in print in The Jewish Journal of Los Angeles.